As regular users of the Air Canada web site, we were frustrated with the user experience. Having made a number of costly mistakes, I finally decided to contact a friend who works at Air Canada, in the hope of get in touch with the people responsible for their web site. Soon we were introduced to the vice president in charge of the web site. She was very receptive. However, the Internet team was closed to the idea having us looking at the user experience. They insisted that survey results were very positive and according to them, the user experience was great. To prove our point, we decided to run an evaluation of user experience at our own cost. We simply asked a few users to execute key tasks, such as booking a flight, checking flight status, finding information on luggage, and so forth. We then showed the video and results to the team. It was obvious to everyone that there was an urgent need for improvement. We were the first user experience company to be engaged by Air Canada; an amazing fact given that their web site generates 4.7 billions dollars in transactions per years. Prior to our work, the only information Air Canada had on the user experience had been amassed through the use of surveys and superficial focus groups run by traditional marketing agencies. When evaluating an existing website, we prefer using remote testing because users are in their own environments. We have found that preserving the typical experiences of users in test groups is essential if we are to get accurate results. In this case, we had brief informal discussions with users about previous travel experiences, future trip plans, and so on. We then ask the users to pretend that they are planning the trips they had described to us. This could have involved booking a flight to Paris, verifying the stasis of a flight, or searching for baggage information. We then asked users to re-execute these tasks as if we were not there. Users were invited to go to other web sites if this is what they would normally do. They had access to Google, Expedia, Travelocity or any other site they might typically use. In this test, we had 12 users perform 16 key tasks. A task was defined as a failure if the user required assistance to achieve the goal. Results were dramatic. User failed most tasks. Based on the test results, we proposed a series of redesign elements using prototype tools ranging from Paper, Photoshop, Powerpoint animation and Axure. We then re-tested. After six iterations, users were able to achieve 100% successful completion of the tasks without any hesitation. Air Canada found that some of the recommendations were easily implemented, while others took more time because they were at the back end of the system. More importantly, Air Canada has now adopted the user experience as a key strategic practice for the organisation. They have hired user experience specialists and built a usability lab. While we know from experience that remote testing is more effective, we applaud Air Canada for the development of the usability lab. This is a clear statement that Air Canada is committed to treating user experience as a priority. 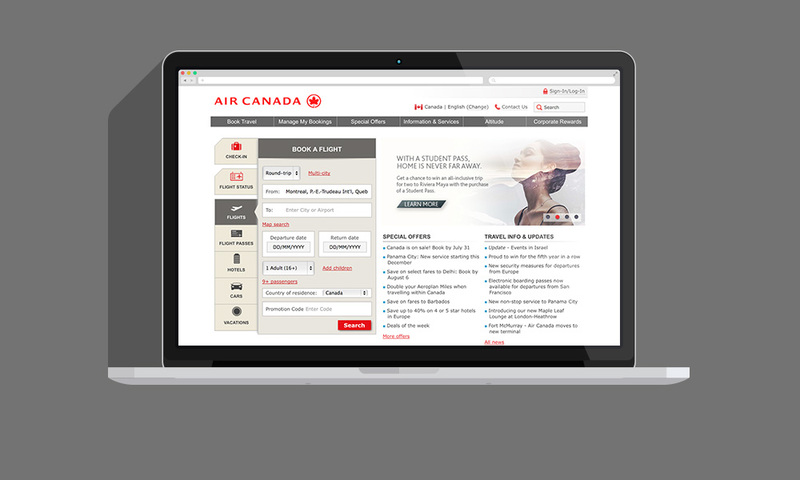 Since our original work with Air Canada, we have been engaged to perform multiple subsequent user experience evaluations for Air Canada to assist in the development of online check-in and mobile strategies.